During this year’s event, the late Arthur Ashe, for whom the U.S. Open’s showcase stadium is named, will be inducted into the U.S. Open Court of Champions, which celebrates the greatest singles champions in the tournament’s history. His name is synonymous with integrity, dignity, and class. 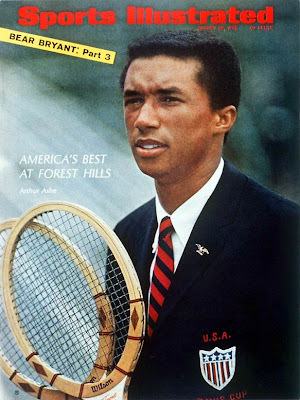 Arthur Ashe was a champion of extraordinary talent and a man of extraordinary grace. The first winner of this event in the Open era, he also was the first African-American man to claim a major title. One of tennis' greatest ambassadors, the man for whom the U.S. Open's grandest stage is named, will forever be recalled as a champion of sport and the epitome of the power of fortitude and courage. The U.S. Open Court of Champions honors and celebrates the achievements of the event's greatest champions with an individual, permanent monument to serve as a lasting tribute to the legendary singles champions during the 126-year history of the event, whose talents have helped build this tournament into one of the world's top sporting events. The 9,000-square-foot outdoor pavilion, bounded by the South Entry Gate and the Arthur Ashe Commemorative Garden and Sculpture, also features a complete listing of all U.S. singles champions since the competition began in 1881. To be eligible for the US Open Court of Champions, players must have won at least one singles title at the U.S. Championships and have been retired from singles at the U.S. Open in the last five years.